Anyone who has seen a newborn in a hospital NICU knows the image is shocking. Wires and electrodes designed to monitor vital signals such as heart rate, brain signals and blood oxygen levels are taped over the frail newborn’s head, face and body. Skin-to-skin contact between mom and baby that doctors say all newborns need to develop a sense of security and bonding becomes challenging, if not impossible. Parents seeing their precious baby this way may also feel terrified and helpless. A new study at the University of California, San Diego will test whether all of those bulky electronics could be replaced with a stamp-sized wearable patch of tiny circuits, sensors, and wireless transmitters that sticks to the skin like a temporary tattoo, stretching and flexing with the skin while maintaining high performance. And by providing, simultaneous, real-time measurements of multiple vital signs, these wearable electronics promise to open up a new frontier in doctors’ understanding of the developing newborn brain. A closeup view of the 'electronic tattoo"
The tattoo electronic device was developed by Todd Coleman, a bioengineering professor at the UC San Diego Jacobs School of Engineering, in collaboration with John Rogers, a materials science and engineering professor at the University of Illinois at Urbana-Champaign. 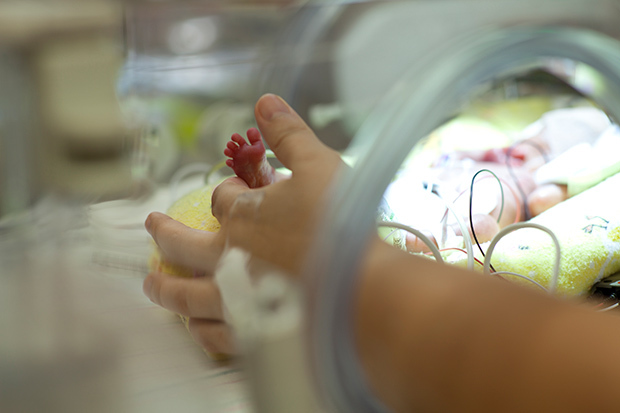 Neonatal intensive care has brought amazing advances in the survival of critically ill newborns. The greatest advance has been stabilizing babies with heart and lung problems. Now, experts are focused on reducing the prevalence of brain-related cognitive and motor development issues that result from seizures, reduced blood flow to the brain, and brain hemorrhage. Unlike seizures in teens and adults, where visible and violent shaking of the entire body are common, half of all newborn seizures present no visible symptoms and can only be detected by monitoring brain waves. In the first phase of the project, the research team, which also includes the departments of neurosciences and pediatrics at UC San Diego Health System, will monitor the brain waves of premature newborns to see how well the tiny device’s sensors detect seizures compared to standard clinical technology. 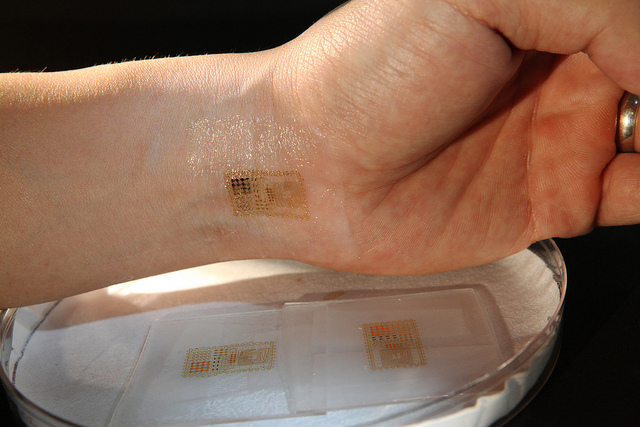 The wearable patch sticks to the skin like a temporary tattoo, stretching and flexing with the skin while maintaining high performance. Photo Courtesy of Materials Science and Engineering Professor John A. Rogers at the University of Illinois at Urbana-Champaign. Early, more reliable detection of newborn seizures will enable doctors to treat them more effectively with anticonvulsant medication. “The longer newborn seizures go untreated, the more problems they may cause in long-term cognitive and motor development,” said Dr. Mary J. Harbert, a clinical professor in the department of neurosciences who founded its new subspecialty in neonatal neurointensive care. UC San Diego Health System is a recognized leader in highly specialized neonatal care and is expanding its capacity for this service. Plans for the new UC San Diego Jacobs Family Medical Center opening in 2016 include a 52-bed Neonatal Intensive Care Unit, or NICU. Currently, neonatal intensive care doctors use a range of technologies to monitor critically ill newborns, including electroencephalography, or EEG, which requires the use of a large cap and conductive gel; ultrasound, which can detect changes in brain structure due to hemorrhage and requires a technician with specialized skills; oximetry, which measures the amount of oxygen in the blood; and near-infrared spectroscopy, which monitors the flow of blood through different parts of the brain. The challenge is that these individual measurements cannot be done simultaneously and continuously. 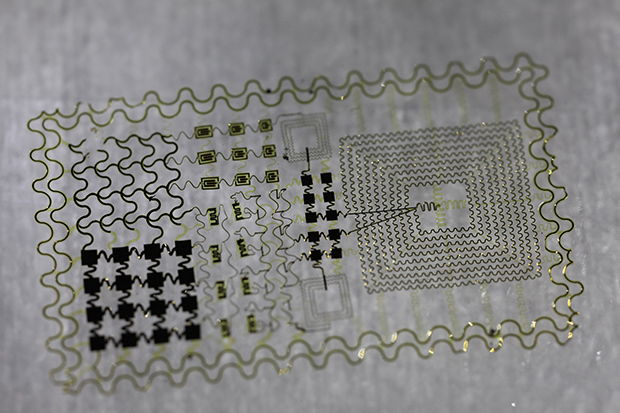 But assembled together on a single, tiny wearable patch, these measurements would provide richer, ongoing and real-time data about what’s going on in a newborn’s brain. It would also provide insight on how these measurements relate to one another. For example, how does the amount and usage of oxygen in the brain change during a seizure? What is the correlation between brain waves and changes in brain structure during a hemorrhage? “We might be able to learn new things about the developing newborn brain by overlapping these technologies,” said Harbert. 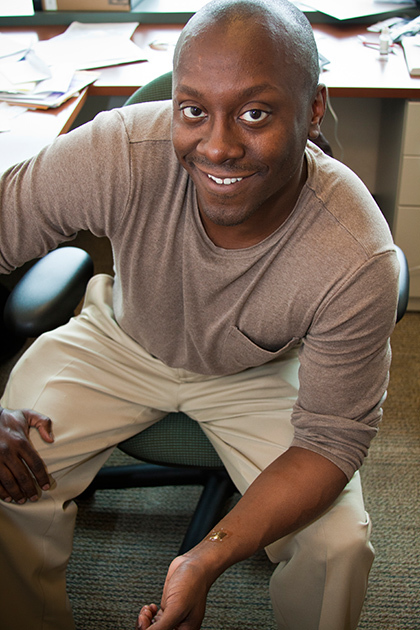 Coleman, whose expertise is in signal processing and neuroscience, believes the study could provide new insights into brain development such as the relationship between certain brain cells and intellectual disability and other developmental disorders. This study also provides several advantages in improving the design of the tattoo device’s novel sensors and wireless radios that can effectively acquire, process and transmit bodily signals. Because the immature newborn skull is not as thick as that of an adult, Coleman expects it will be easier to acquire brain signals and other key information such as brain oxygenation, resulting in a richer data set. He also believes the technology has enormous potential to improve global health outcomes for both mothers and babies before and after delivery. Towards that end, Coleman’s lab is working with Dr. Gladys Ramos, also with UC San Diego Health System, in a related study that will use the tattoo electronic device to monitor pregnant women in labor. Funded with a $100,000 grant through the Bill & Melinda Gates Foundation’s Grand Challenges Explorations initiative, the project is designed to improve doctors’ understanding of what causes premature labor and eventually prevent it through noninvasive and reliable wireless electronic monitoring of at-risk patients. It’s a capability that would be useful in both industrialized and developing countries. “In many developing countries, healthcare access is limited but mobile phone usage is high. If the electronic tattoo could transmit bodily signals to a mobile phone, where it could be uploaded to the cloud, a doctor thousands of miles away could securely access the data and provide clinically actionable advice,” said Coleman.